When the Northwestern Hawaiian Islands Coral Reef Ecosystem Reserve was established in December 2000, the Executive Order signed by President Clinton directed the establishment of a Reserve Advisory Council, in accordance with the National Marine Sanctuaries Act. The Reserve Advisory Council (RAC) is a community-based advisory group consisting of representatives from various constituencies, providing a public forum for community consultation and deliberation on resource management issues affecting the Reserve. The role of the Council is to provide advice and recommendations to the Office of National Marine Sanctuaries; since its inception, the RAC has played a key role in the development and implementation of the Reserve Operations Plan, as well as the inaugural Monument Management Plan when the Reserve became part of Papahānaumokuākea Marine National Monument in 2006. 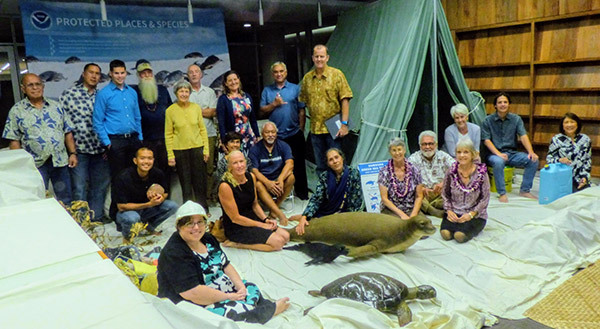 Reserve Advisory Council members represent Conservation, Research, Education, Native Hawaiian, Recreational and Commercial Fishing and Ocean-Related Tourism interests, as well as the State of Hawaiʻi and the community at large. Council meetings take place quarterly and are open to the public. There are also a number of Council sub-committees and working groups that address particular issues or tasks. In addition to the 15 voting members that represent constituency groups, there are 10 non-voting members representing stakeholder federal agencies. Visit the meetings pages below for meeting time and location, minutes of previous meetings, binder or handout materials and other information from the meeting. Please contact Nicole Evans, Planning and Evaluation Specialist at (808) 725-5818 or email nicole.evans@noaa.gov if you have any questions.